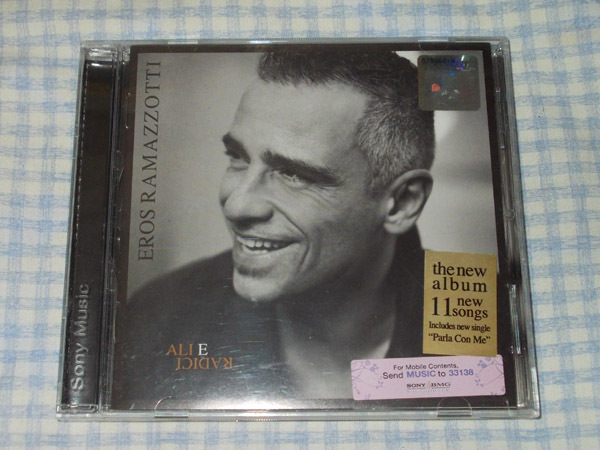 Randomly picked a disc to listen to and I got ‘Ali e Radici’ (Wings and Roots) by Italian singer Eros Ramazzotti. One of those singers I probably have ten CDs from. I haven’t counted, but we’ve been fans for a long time. This is his tenth studio album, out of a total of eleven, which he released in 2009. Most of his albums are released in both Italian and Spanish. I remember years ago when I was not aware of this yet, I had mistakenly bought a Spanish version of one of his albums. Which is okay but some time later I went back to buy the Italian one as well. I haven’t played his music for a while, and forgot how much I love his unique voice and his gorgeous catchy songs. He has written and sang a lot of beautiful ballads too in his career that has by now spanned more than three decades. He was born in Rome in October 1963, so now he’s fifty. The following is one of my favourite songs from Ali e Radici. Parla Con Me (Talk To Me) is the third song in the album. I love so many of this songs, but just to pick two more to put here, well I love his two duets with not one but two ladies of music I absolutely adore, Tina Turner and Cher! Cose Della Vita (Can’t Stop Thinking of You) with Tina was released in 1998. The song is a ‘remake’ of a song he wrote and sang solo on in 1993. The beautiful ballad Più che puoi (All You Can) with Cher is from 2001. 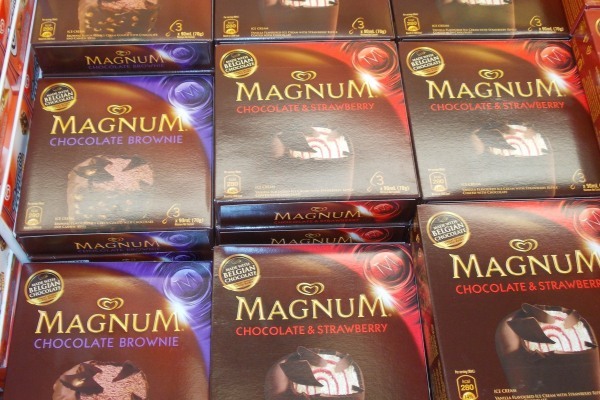 I was shopping at Jusco supermarket in Johor Bahru and came across my favourite ice-cream on a stick, Magnum. I love Magnum. It’s so creamy and rich, truly delicious. In J.B. it’s so much cheaper than in Singapore. 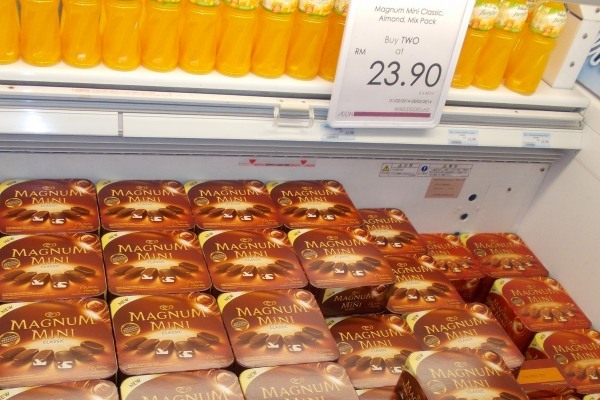 In the first picture above, I captured the special offer price of RM23.90 for TWO boxes of the mini ones. At a rounded off currency exchange of 2.5 to an SG dollar (actually as of writing now it’s more around 2.6) that’s only SG$9.56. In Singapore, based on this flyer I found on singapore-promotions.com, a special offer price of those two boxes would be around SG$15. So that’s more than 50% more expensive! Of course bear in mind that different supermarkets in both Singapore and J.B. will feature different prices and at different times as well. 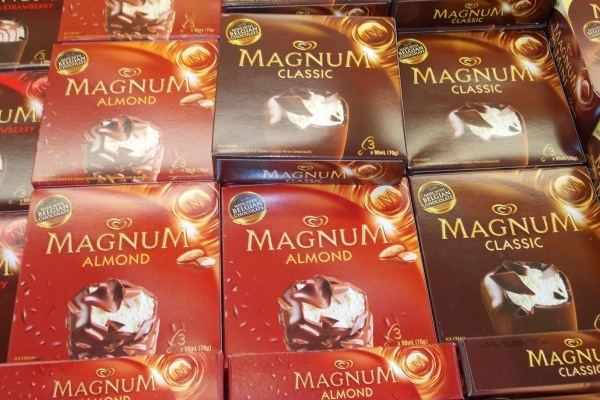 Regular-sized Magnums come 3 in a box, at 90ml each. Whereas the Mini ones, are exactly half at 45ml. Perfect for those on a diet, or those who simply find it too rich and sinful. I tend to get these, as I find it satisfyingly big enough already. Naturally I have tried these two flavours as well and love them too. 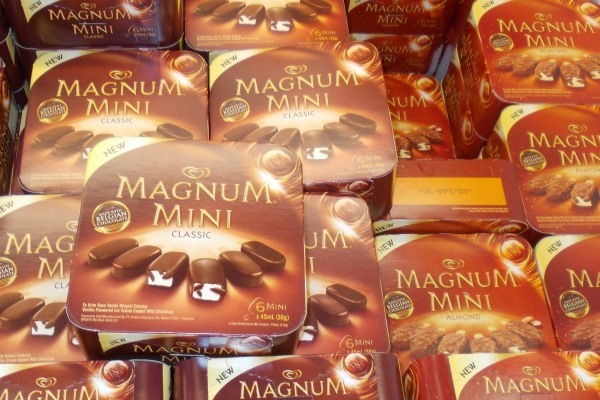 In unrelated news, well not really unrelated since I did drool and lust over him growing up, this is another Magnum I think of when I hear or see the name. Ooh yummy. Tom Selleck a.k.a. Magnum, P.I. Image from the Tumblr site ZestyBlog, via the Pinterest page Hollywoody. Click image to go to the latter. A video of an episode found on YouTube thanks to user Michael Knight. This post is Day 15 of ‘100 Happy Days‘.